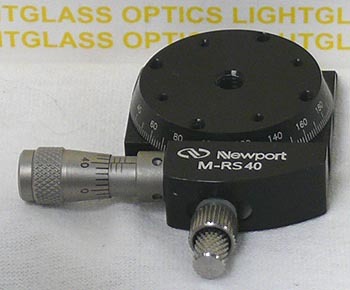 The Newport RS40 Rotation Stage has a 40mm diameter rotating top plate, and has mounting provisions to orient optics in either the vertical or horizontal position. This is the standard version and includes a Newport BM11.5 micrometer actuator. Resolution is 16 arc-seconds! The top has drilled and tapped holes around the perimeter and a 1/4-20" hole in the center.